But, the Carcassonne France we’re going to talk about, is the largest completely walled medieval city that is still intact in all of Western Europe. There is another very large medieval walled city in Europe called Dubrovnik, but Carcassonne is bigger. What Is the Cathar Religion? On today’s show, will be talking about the marvelous walled city of Carcassonne. Carcassonne is also a world heritage UNESCO site and it is an important tourist destination in the Southwest of France. But to a lot of other people, Carcassonne is a board game. It’s a wonderful build your own civilization game. Carcassonne is in the department called Aude, named after the river Aude which runs below the ramparts. The walled city is perched on top of a promontory in a long Valley that cuts east to West from the Mediterranean. On the north side, you have rocky cliffs, and you enter into an area called Massif Central, the local mountains or hills to the north of Carcassonne are called Montagne Noire. It is called the black mountain because of the density of the forest, and because it picks up large amounts of humidity. These are low mountains. On the south side of this Valley you enter into the foothills of the Pyrenees, which are much higher mountains. 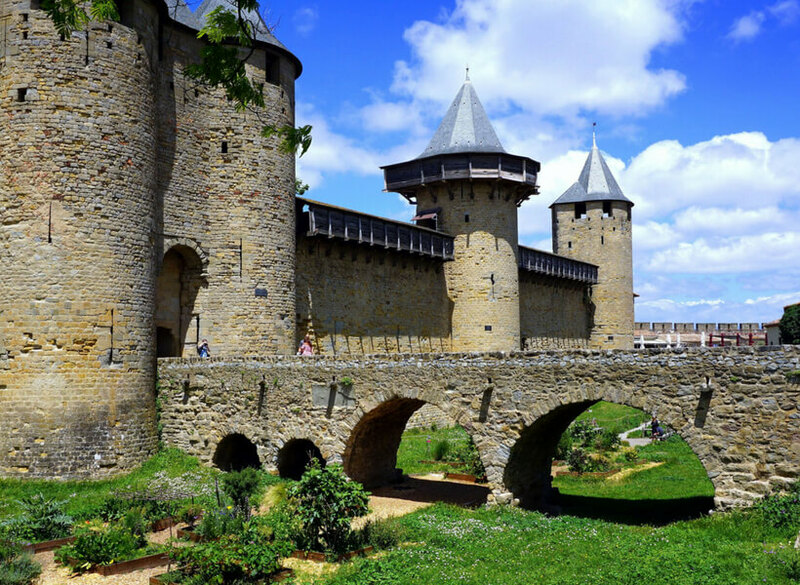 Carcassonne was originally settled by Celtic tribes. All over France, Celtic tribes are usually the first ones to be documented to have occupied the land. There were probably people there before, but we don’t have any trace of them. Each Celtic tribe had its own name, and they called this particular settlement Caraccass. We don’t know if it means anything. Everywhere they went, the Celts built an Oppidum which comes from a word that means defensive settlement. It was a place that was built high up, or in an isolated place, with 360 views around, and with protective walls around it. And that is what the Romans found when they got there at about 100 B.C.E. The Celtic settlement was not on the exact promontory were the walled city of Carcassonne is today, but very close to it. Romans took over this area and this is the promontory where we go visit today. They set up their own reinforcements and new walls reusing limestone that they found nearby. The Romans built their own small city, with ramparts around it, the original Roman walls were about a mile around. They built the walls with classical U-shaped towers and distaste was used primarily as a military outpost, but there were people that lived there also. It is and this is going back 2000 years. When you go to Carcassonne today you get to see these walls! 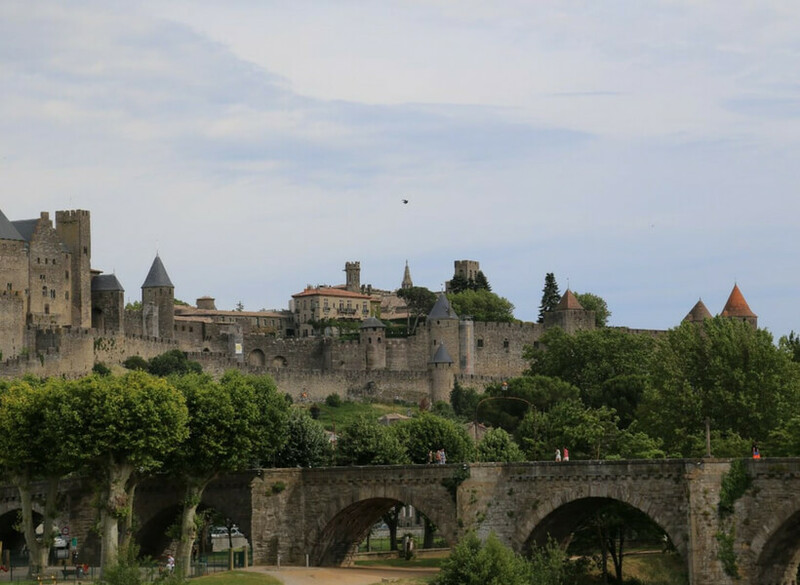 The walled city of Carcassonne is particularly interesting for people who want to understand the evolution of architecture between the Romans and medieval times. This is a typical city for military architecture but also civilians. The way the city was restored makes it possible to understand the past. Carcassonne is in the Mediterranean region. It is a wine-growing region; they are grapevines, cypress trees, and pine trees surrounding the old city. It’s very beautiful. Carcassonne is not very far from Narbonne which is the main Roman settlement on the Mediterranean coast and was a major settlement. Carcassonne has a relatively dry and sunny climate. It gets a fair amount of wind, “vent d’Autan”. Under the Romans Carcassonne developed into a major trading center. This area had major textile industry, especially woolen goods. The area had a lot of sheep. The nearby town of Mazamet is still known for the quality of its woolen goods. Carcassonne was always a very good place to make a stop, because it was safe being high up on the hill, and there were places to sleep and places to eat, just like there are now! A few years ago, the New York Times listed the Hotel de la Cité in Carcassonne as one of the hotels in the world were you had to stay sometime. Elise had a chance to sleep in that hotel on business, but she normally doesn’t stay in a lot of five-star hotels. The amenities are very nice in this hotel; Elise got a magnificent corner room with antique furniture and a beautiful view on to the ramparts. The atmosphere of the hotel is lovely also, it has a highly rated restaurant, a very nice bar, a swimming pool, but the rating also has a lot to do with where it is situated. 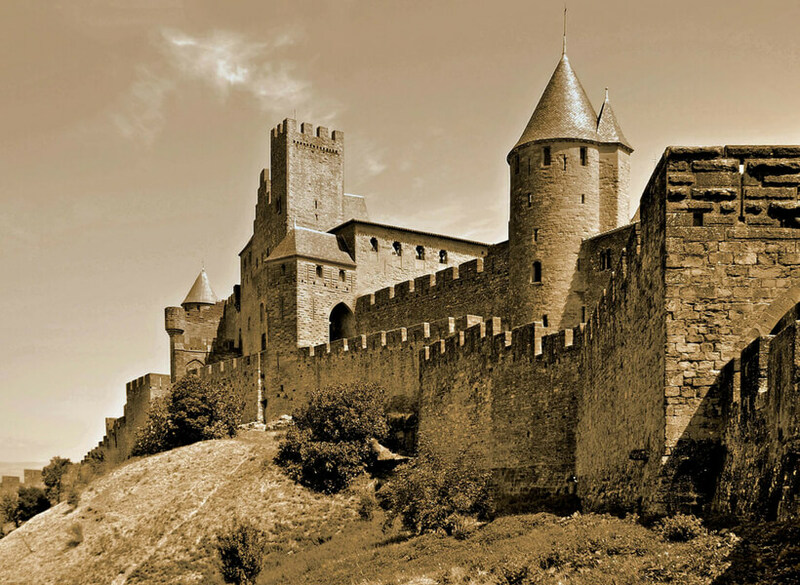 Moving on to the 1200s, Carcassonne played a major part in the story of the Cathars. We will eventually do a podcast on this particular topic. These events affected the Southwest of France greatly, but had no effect anywhere else in the country. There was a war in the first half of the 1200s between the Roman Catholic Church and the new Christian religion called the Cathars. This seems like ancient history to most people, but it is really relevant to what happened in the Southwest of France. This war was instigated by the Pope in Rome in conjunction with the King of France. In the 1200s, the Southwest was not part of France. The Southwest was a separate kingdom run by the count of Toulouse. The counts of Toulouse were direct descendants of Charlemagne. The designation of count was like the designation of King for this area. The count of Toulouse ruled territory that went from the Mediterranean and above, almost to Arles, and as far west as the Dordogne. There were other Dukes and vice counts that were all cousins and part of the same family. They ran this territory in the feudal structure. In today’s Southwest of France, the Cathar religion took root due in part to the spirit of independence and a certain laxity. There were also theological reasons that are hard for us today to understand. The new Christian movement developed starting in the 1100s that came from northern Italy, Lombardi, where it was also very important. Apparently it had originated in Eastern Europe. It moved through Provence into the area of the Southwest where it became very important. This new Christian movement, which could be considered as a parallel to the Protestant movement in the way that it opposed the Roman Catholic Church, became very important in a couple ways. Cathars did not have a pyramidal hierarchy. Many of the people who were resentful of the Roman Catholic Church resented its enormous political power and wealth. The people had to obey the priest, the Bishop, the Cardinals, and had no choice in the matter. There was also a lot of repression. The church was accumulating enormous amounts of wealth. The church at the time was more powerful than Kings and princes. By opposition to that, the Cathar movement allowed for everyone to be equal. You became a member of this faith by the laying on of hands and the recital of prayers. It allowed for people to take on a sense of equality. Cathars gave as much importance to women as they did two men. Women could be clergy, women could do conversions, women could do last rites which were called Consolamentum. Large numbers of aristocratic women in the Southwest joined this movement, and so did the men. The counts, vice counts, a lot of their wives, sisters, and mothers, had joined the Cathar faith. A lot of the time women who were older and who had passed their childbearing years not only converted but also became members of the clergy. In order to become a member of the clergy, called a Perfect, you had to renounce sexual activity, you had to live in communal houses (women with women, men with men), you had to become a vegetarian, and you had to do good works. A lot of them were weavers, worked in the textile trade, which is one of the reasons why Carcassonne had such a large textile trade, and you traveled around from village to village spreading the good word. You lived with the people, and you shared whatever you had. Perfects could not use weapons, or even hold a weapon, but they had knights who were sworn to the protection of Perfects. This region surrounding Carcassonne and going as far west as Toulouse becomes a hotbed of this new religion, and in the beginning of the 1200s, the Roman Catholic Church decides that it was losing its influence, and they had to do something about it. They join together with the Kings of France. Simon de Montfort, the Vilain. Remember that the King of France was this person in the North who coveted the Southwest because it was very rich land and also very large. After getting funding from the Pope, the King organized an enormous army of 40,000 soldiers, led by a minor nobleman from Normandy called Simon de Montfort who was the 12th military man loyal to the Roman Catholic Church who had been asked to lead this war against the Cathars. Many other noblemen had refused because they were all intermarried and related to one another, and they did not want to take part in this horrible fighting down south against people that they had nothing against. The war against the Cathars started in 1209 and ended in 1229. There was not constant fighting for 20 years. The Pope and the Kings army won mostly because all the lords in the Southwest, including the price count of Carcassonne named Roger Raymond Trencavel, were unable to unite. They were very uncooperative with one another and these disagreements make them easy to beat. Trencavel was a very brave young man who lived inside the castle within the walls of the city of Carcassonne , tried to unite all these people, but his forces were not as large as he had hoped. This enormous army of the King arrived in Carcassonne and surrounded the city. In the early 1200s, and this is a little bit hard to believe but it’s true, there were no wells inside the walled city of Carcassonne. There were three small rivers running nearby and people always went out of the walls to the rivers to get their water. There were huts huddled outside of the walls and there were probably wells there. One of the deals of feudalism was that when there was trouble poor people could go inside the walls and get protection. The Kings army surrounded Carcassonne in July 1209 and within three weeks there was no water left and there was barely any food. Trencavel negotiated with his army to surrender himself if they would let his people go free. The Kings army had been killing a lot of people along the way getting to Carcassonne, and Trencavel wanted to avoid more bloodshed. The King accepted his surrender. Trencavel was put in the prison of his own Château and by November 1209 he was dead. He was 24 years old. He already had a five-year-old son; his wife was the daughter of the count of Narbonne. She was allowed to go free with her son in exchange for signing over all the heretic Terry writes that her son would have enjoyed otherwise as the vice count. She and her son went to live with her uncle the count of Foix which is south in the Pyrenees. Carcassonne was taken over by the Roman Catholic prelate was representing the church and by the representatives of this northern King. In 1229, the old city of Carcassonne was built on the ruins of the old Roman walls, there was a castle built onto the walls inside, there was a Cathedral which is still there, and there were probably several thousand people who lived and worked inside the city and the villages that have cropped up outside of the ramparts. Everybody was evacuated away from Carcassonne. 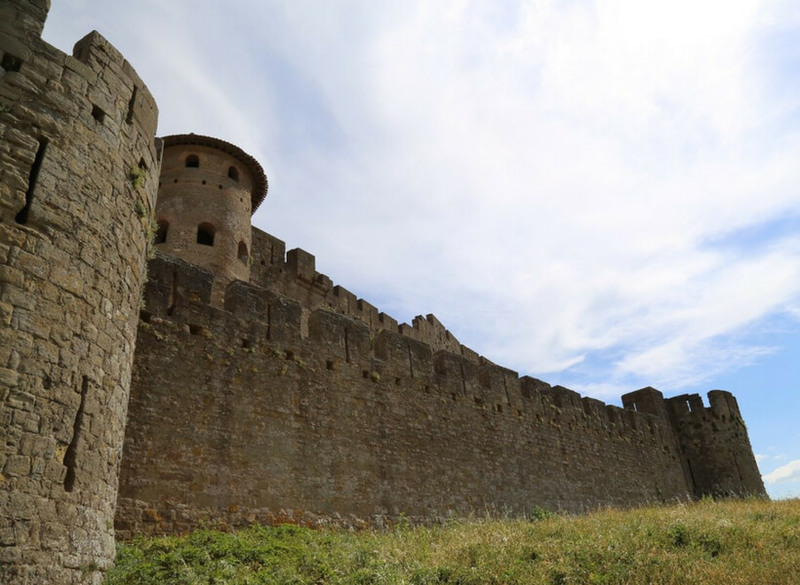 It was made into a military outpost, and the French King and his two descendants consequently, including Saint Louis later in the early 1300s, decided to build a second set of ramparts, which is why you see two sets of ramparts when you visit Carcassonne today. They felt was necessary because Carcassonne was such an important trading route. The second set of ramparts, which still exist today and are very impressive, are built on very steep land on three sides. The first set of walls was at the edge of this promontory, so there was no land on which to put a second set of ramparts. So, in order to build the second set of ramparts, they dug out a little under the foundation of the first set of ramparts and brought lots of dirt from down below. They had to bring enough fill to level the area and create what is called a “Lice”. It took several years and was all done with human labor. The “Lice” is the enormous walkway that in circles completely the walled city of Carcassonne and beyond the Lice is an enormous secondary wall that is 3 km long that in circles the walled city completely. They doubled the number of towers. There were 26 Roman towers and now there are 52. The castle within the walls that you can visit today is on the north side. They think there used to be a different castle on the south side there is nothing left of it. The grandfather of their young Trencavel who died built the new Castle in the 1100s on the north side and used the inner ramparts as one side of the castle. When you enter the castle for the visit, there is a large plaza and there’s a little doorway that takes you to a piece of the original Roman wall. There are private visits that can take you to see Roman mosaics and beautiful relics in that area. 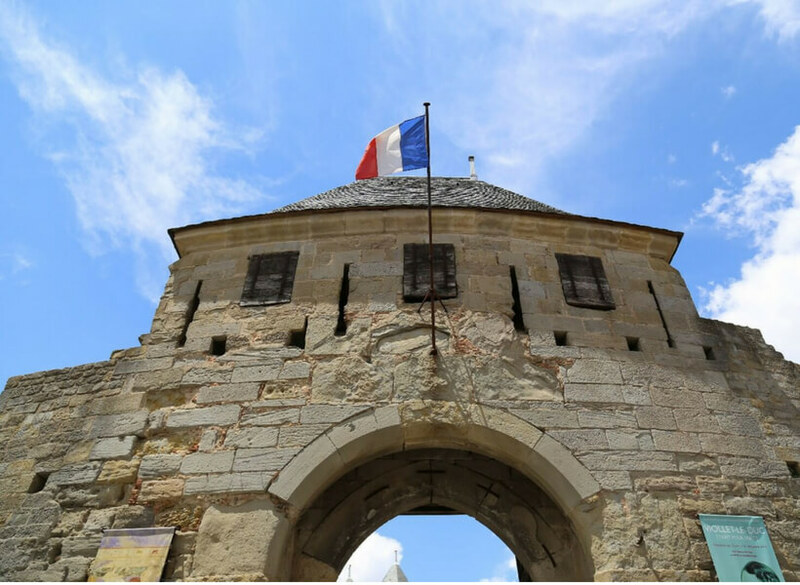 A third reason to build a secondary protection wall around the city of Carcassonne is that as it became part of the kingdom of France it is now on the border between the kingdom of France and the kingdom of Aragon. The border was only 10 miles away at the time. A garrison lives in Carcassonne and the people who were sent away earlier establish a new city on the other side of the Aude River not very far away. The garrison was there in part to make sure that the old residents couldn’t come back. With the second wall, the city of Carcassonne is now impregnable. The walled city of Carcassonne developed such reputation to be impressive and impregnable that when the Black Prince “Prince Noir” (vagabond evil English prince) came through the area the end of the hundred year war in the 1400s between the French and English didn’t try to take it. There were bands of English soldiers who got left behind when the hundred year war ended, and they became bandits. The Black Prince came through the Southwest of France these bandits and they vandalized, stole, destroyed, killed all through the Southwest. People were terrified of him. The Black Prince attacked the lower part of Carcassonne outside of the walls and completely bypassed the walled city of Carcassonne without trying to take it all. 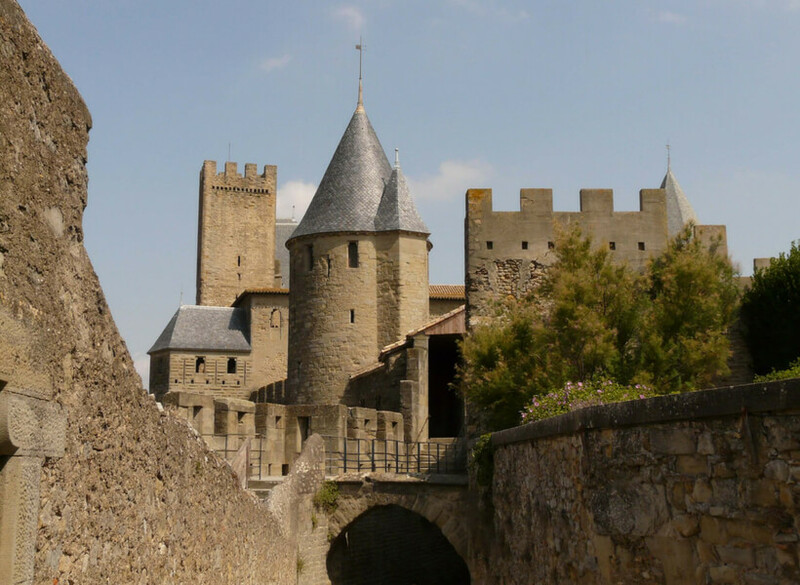 The new city of Carcassonne date back to the early 1300s. The new city of Carcassonne is not all that interesting today although it was for a while. 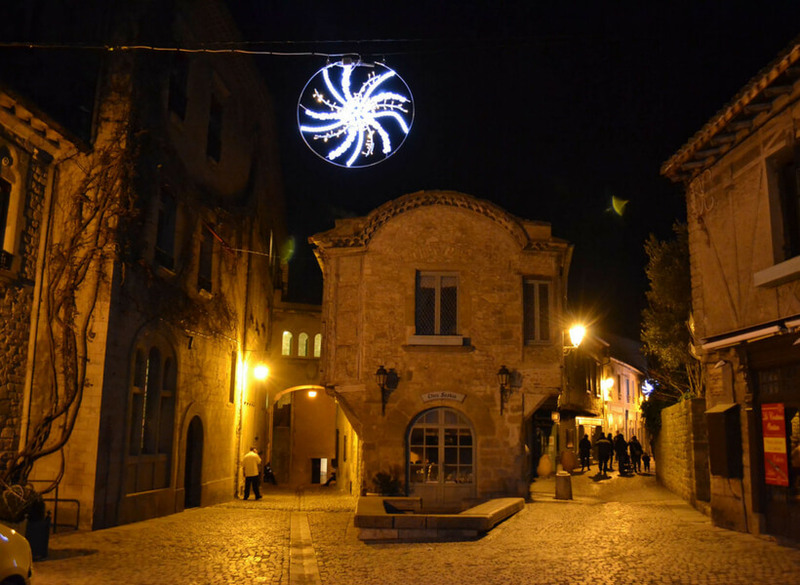 It is built in the shape of a Bastide, which means it was built in the shape of a grid system. They built their own Cathedral to rival the Cathedral up above, but today it’s not that impressive. Visitors do not go to visit the lower Carcassonne. But if you take the train to get to Carcassonne you will arrive in the lower city. There are also hotels in the lower part of the city. The fate of the walled city of Carcassonne becomes more interesting as we get closer to modern times. It stopped being a military outpost in the middle of the 1600s when the frontier with Spain moved further south. At that time the walled city was abandoned. Then squatters took over up through the French revolution. At the time of the French revolution the treasure and reliquary that was inside the cathedral were stolen or destroyed. There used to be documents in the archival tower of the walled city of Carcassonne dating back from the Romans and the war with the Cathars, but everything was burned. And the old city was left to abandon. In the beginning of the 1800s the idea was that they were going to tear it all down. It was in ruin, especially the roofs. The roof is always where extensive damage starts. Once the water gets in, the walls will get damaged, and it will fall into ruin. Inside of the walls there were houses, it was a city. After the French revolution more squatters arrived and it fell into more and more disrepair. 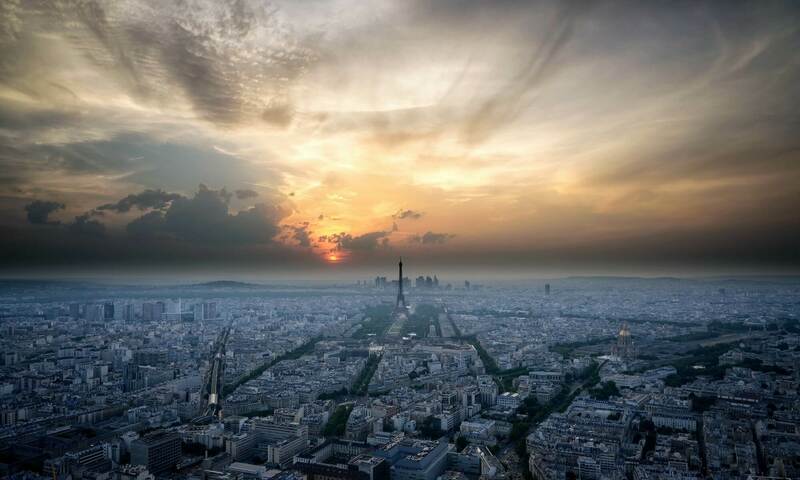 In 1820 a local historian decides to write to the people in Paris to call for help. He felt strongly that it was worth saving as a document to the medieval history of the Southwest. His appeal gets to Prosper Mérimée who was both a writer and the first French Minister of monuments and culture. Mérimée tasks Viollet-le-Duc who was an engineer and who developed a passion for medieval architecture. In the 1700s and 1800s medieval architecture was considered to be very ugly. Gothic was also considered to be ugly. Even the word Gothic meant something ugly. In the 1830s Prosper Mérimée came south and he fell in love with it. By this time you have to have a good imagination to see how beautiful it really was because poor people had squatted, there were huts again on the outside of the ramparts, there were people squatting between the two sets of walls, a lot has been destroyed. Prosper Mérimée and Viollet-le-Duc were able to convince the administration that this structure was worth saving. Starting in 1850, they started work to restore it. Only 30% of it needed to be restored which isn’t too bad if you consider that it is a very old. Most of the work done was on the tops of the walls and the rooftops. They had to rebuild a few of the towers, especially the archival tower which had been destroyed and fire. They worked on the counts castle. They added a few things that they thought were there originally, the wooden structure near the castle and the “barbacane” (barbican) which is a half circular space that opens up to the counts castle. They assumed that’s what it looked like. Some of this came straight out of the imagination of Viollet-le-Duc who had is a reference only what he saw in Paris and in the northern part of France. That means beautiful conical shaped roofs with slate. It’s very unlikely that it looked like that originally. Local towers have mostly flat roofs with terra-cotta tiles in the Roman style. When it began the renovation work, there were already people who were contesting the style of the renovations. The renovation work began in 1855 and was not finished until 1910. There are photos that show what it was like in those days and there are lots of people who think he didn’t do a very good job because it doesn’t look like what the Southwest would’ve looked like at the time. There are people who say Carcassonne is fake as a result. We think that’s a silly argument. The castle at Disneyland is fake because there is a castle where none used to be. Viollet-le-Duc could have been more faithful to drawings and engravings, but he chose to go with his idea of what it should look like. There are buildings that were really redone after Viollet-le-Duc in other parts of France, but in Carcassonne the task was too monumental. So what you see is some roofs that are faithful to the original work in terra-cotta, and some that are made with slate there are not as realistic. The buildings were restored using techniques of the Middle Ages. This hotel was built in 1920; it’s not far from the count’s castle. It’s supposed to have been the Bishop’s Palace that was taken over and renovated, but that’s a little bit fake. They used the old stone, but it’s a recent addition. It was rebuilt in a NeoGothic style. It looks like it’s as old as the other buildings, but in fact it isn’t. In the 1940s, the Germans occupied Carcassonne; they used it as a munitions depot. In 1961 the entire walled city was declared to be a Museum, and in 1997 it became a UNESCO world heritage site. It has become a huge success as far as the number of visitors. 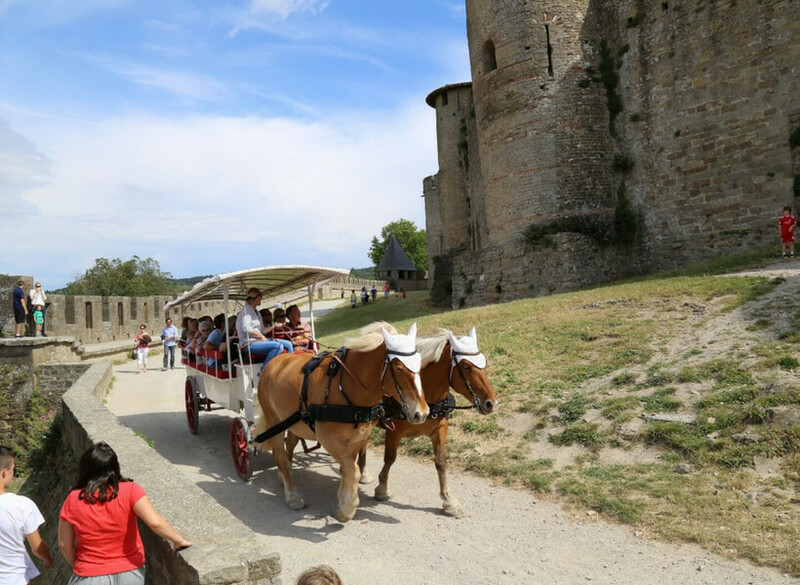 In 2011 over 4 million people visited the walled city of Carcassonne, and most visitors go in the summer. It gets very crowded in July and August. Like all the other important to his places, it is going to be packed. It’s 15 acres total. The streets inside are still the original very narrow streets. Semi-steep cobblestoned streets filled with shops, it is quite touristy, which is not necessarily a bad word. Strollers in wheelchairs could be a problem because it’s cobblestoned. If you have to go during the high tourist season, either get there at 9 AM or after 3 PM. All the tourist buses tend to show up in the first half of the day. Also, don’t go on a Saturday or Sunday if you don’t like crowds. You don’t have to pay anything to go into the walled city of Carcassonne, but you do pay to visit the Château (Château Comtal). There are guided tours of the Château English once in the morning and once in the afternoon, but the English is quite approximative. 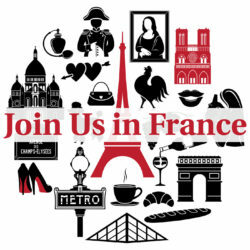 You might be better off reading the brochure in English or listening to this podcast. You should also visit the church because it has some very beautiful stained glass windows. There are only six of these stained-glass windows, but they are the originals. They are as beautiful as anything you will see in Notre Dame or the Sainte Chappelle. Other places in the Southwest do not have such beautiful stained glass windows. The shops in the walled city of Carcassonne are wonderful but touristy. If you are interested in table linens it’s a good place to get them and they are not more expensive than anywhere else. There are a lot of restaurants; a couple of them are fine restaurants. You can have a lovely lunch on the outside square called Place Marcou, you can also have dinner there, restaurants stay open until late. You have to tune out the fact that you are surrounded by lots of other people. When you go with little children, it’s fun because the shops sell all these wooden swords and shields and dress ups. There are a couple of nice toy stores, great ice cream places, some very nice candy stores, there is a Museum of torture, nice T-shirt stores. Some of these items are difficult to find in the surrounding areas. One night a year is very special and that’s on 14 July they do fireworks in the old Cité. They evacuate the whole place and they set up fireworks on both sets of ramparts. If you are someone who loves fireworks, it’s really stunning. They estimate that 700,000 people go to see it every year. You can see well from anywhere down below (it’s especially good from the bridges). You do have to get there early to get a good view. Most people spend between two hours and a half a day to visit the old city of Carcassonne. The regional food specialty is called Cassoulet. When you walk around the ramparts pay attention to the towers in the walls and notice the difference sizes of stone. The difference sizes indicate different building periods, but they are not necessarily laid out in chronological order. And when you go take a podcast with you because Elise is now going to tell you the secrets of the walls: the small regularly cut stone interspersed with two or three layers of red brick is real Roman wall. That part of the wall is almost 2000 years old. The stone that is rounded, in French it’s called “bossu” almost looks fake, that’s from the 1300s when they built the second set of walls. Occasionally as you’ve walk around you will see filler in various places because they had to fix things up sometimes. At the bottom of the first set of walls sometimes you can see very large exposed rocks, that’s where they had to dig out. And if you see massive pieces of stone, these are prior to the Romans and probably Celtic. On a clear day you can see the Pyrenees on the south side. They produce some wine in that area, not the best wines in France. There are some very good Corbières wines and the vintners in that area are trying to raise the level of their wines overall. Carcassonne can get very hot in the summer and chili in the winter, and it has a lot of wind. Just in case, you should probably bring a light jacket or cardigan. In the area we say that the “vent d’autan est le vent des fous”, which means that the wind makes people crazy. Carcassonne is a wonderful place to visit and at least 4 million visitors have figured that out already. You should go see it if you have a chance.